The Pinkfoot Goliath Tarantula is a highly desirable and massive tarantula species! Although the Goliath Birdeater (Theraphosa blondi) is renowned for being the largest spider in the world, some breeders and hobbyists believe otherwise. The Pinkfoot Goliath Tarantula was described 187 years after the Goliath Birdeater, therefore it's not as well-known. Recently, this species changed from the Pseudotheraphosa genus to the Theraphosa genus. Whether or not it's the largest tarantula species, the Pinkfoot Goliath Tarantula is still an immense spider, with some specimens recorded up to 13 inches in legspan! In the wild, they are found in burrows up to 24 inches in the ground! Since most people can't provide it with that much substrate in captivity though, and since most people want to see their tarantula, four to eight inches of substrate is acceptable. The Pinkfoot Goliath Tarantula is a moderately aggressive species with severe urticating hairs. It is not a beginners' species. Unfortunately, Pinkfoot Goliath Tarantulas are very rarely bred in captivity. They also can't be exported anymore, since Venezuela is closed to exportation. Pinkfoot Goliath Tarantulas are some of the hardest to find tarantulas in captivity, and they are quite possibly the largest spiders on earth! 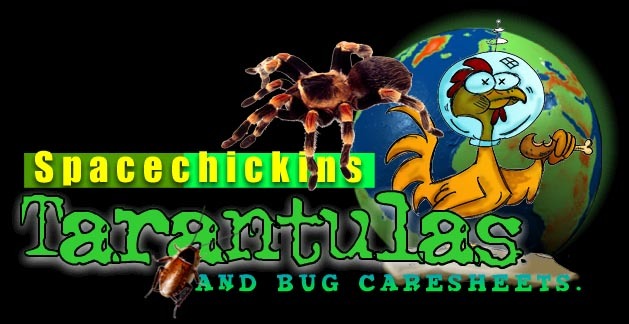 Welcome To Spacechickins Tarantula Caresheets. And bugs for feeding them. Hope that you can use the information. That ALL tarantulas have a certain amount of venom. Although most people are not affected by these species, some people may be allergic to the venom, or just more sensitive, making it a dangerous situation. This is one of the reasons that people should not handle this tarantula. Also, New World species of tarantulas like this one can flick urticating hairs off of their abdomens, which can also cause a reaction, depending on the person. Affects of this tarantulas' natural defenses may vary between people. All tarantulas should be considered dangerous, so be careful, because you don't want to find out if you are allergic or more sensitive the HARD WAY!